You’ll need a wok or a large saucepan. Heat the oil in the wok or pan over medium high heat. Add the garlic and ginger then stir until they release their aroma. Add the sliced leek and keep stirring. Add the rest of the vegetables and constantly move the mixture. Add the rice (keep stirring) with the soy sauce and scrambled egg. Serve hot with the side of your choosing. Add chopped nuts and the vegetable you like most. You can use ready-to-eat white or brown rice. 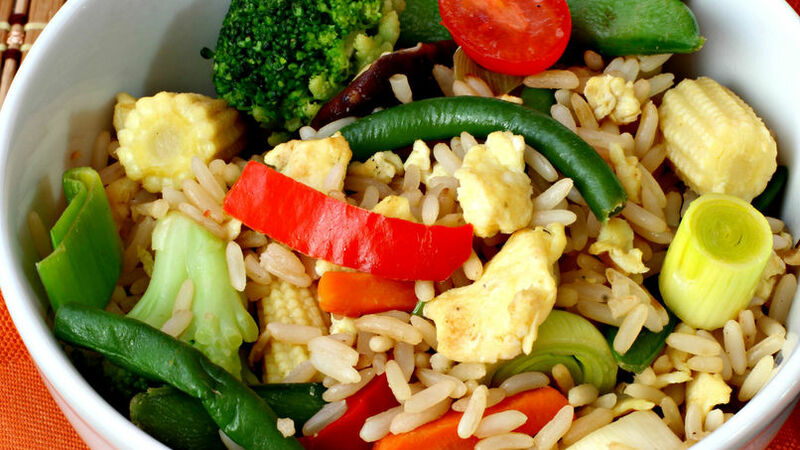 Prepare this delicious fried rice with vegetables to serve with a beef or chicken dish. There are many versions of this fried rice recipe and they’re all very good. The best part is that you can create your own version by using the vegetables and ingredients you prefer. This is why I’m sharing this recipe with you today.